Magnet advertising allows marketers to get creative with their branding. If you believe in an old adage – Fools learn from their own mistakes and wise learns from others, you can easily relate to this blog on indulging 9×6 magnets for incorporating great branding lessons. Give Customers, Which They Want, Rather Than Asking Them What They Want. Offer answers for which rather than asking what. 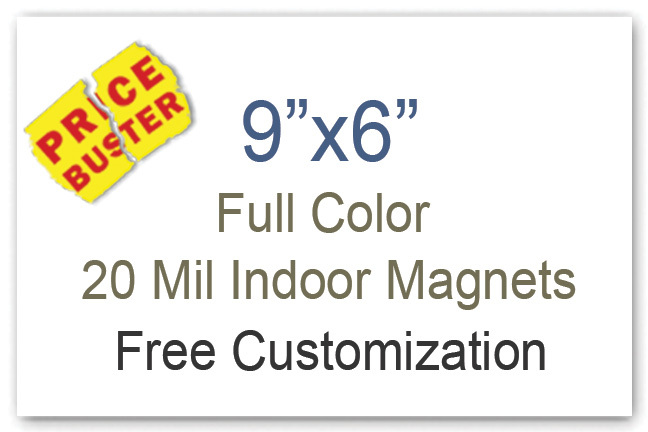 Promotional 9×6 magnets offer you large space for answering which’s over what’s. Use 9×6 magnets to build your menus, business flyers, small impressive flyers, or brochure material. People would be happier to retain such information over their refrigerator doors for years to come. Customized 9×6 magnets offer you large for positioning customer centric information. Nowadays, customers are not very particular about what you have to offer them; rather they see how you can enrich their user experiences. You can avoid sounding like a schoolmaster and take a friendlier stand. Tell people how you can help them to achieve their purpose by offering them friendly help guides. All these years, you were only going on describing why your product is the only best thing available in the market. This time, you can offer them a great story and ask them to read it. You can employ these great promotional magnets for creating emotional advertisements and enriched experiences. Perhaps you know about it more than the writer of this blog post, isn’t it? You know nowadays consumers are getting smarter and they expect you to score up to their expectations. You can try to sketch authenticity over these large customized magnets by printing your registration, logo, and other business details. People would definitely love to retain such large promotional magnets over their refrigerator doors and your business information slowly percolates into their consciousness. Everyone is offering discounts, savings, freebies and lot other things, how should you differ? This should be the prime target while focusing on a marketing strategy. Suppose, your bakery is operating in one of the busiest areas of the city with the line-up of several bakeries and during the holiday season, you are getting business because there is a high demand for baked items. This flow may not continue for a long time because you are no different from others and people would easily get bored of you. Perhaps, you can keep them grounded by offering the unique flavored baked goodies of the season. It will give people a chance to come back to you every time, they want to try something special and in-lieu with the trend. You can use large 9×6 magnets for developing focused strategies in particular seasons. All these years, you concentrated on direct selling. Customer engagement was never an issue on your radar. Now, you should start thinking about it seriously. Employ 9 x6 magnets for encouraging deep customer engagement. You can perhaps use it as a business poster or calendar magnet to achieve your target because people cannot ignore them. It is slowly influencing their decision and encourages deep customer engagement over customized 9×6 magnets. The above ideas were extracted from lectures presented during Incite Summit in 2014. You can experiment with these ideas in all types of marketing. Purchase 6×9 magnets from any reputed online eCommerce store to save on online design proof, art set up, full color printing and shipping because their prices are included in the product pricing.